Footage has emerged of a group of children attacking two police officers in south London, punching them in the face and stamping on one officer’s head after he fell to the ground. The incident, which took place on November 9 in New Cross, involved a male and female officer and has been described as “truly shocking” by the Metropolitan Police Federation. The children had gathered outside a school in New Cross to witness a fight between two female students, arranged and publicized on WhatsApp. Coming mere months after an officer was stabbed in Hyde Park while attempting to intervene in a huge water fight involving 4,000 teenagers, this latest incident is an indication of increasingly fraught relations between London’s police force and its youth. 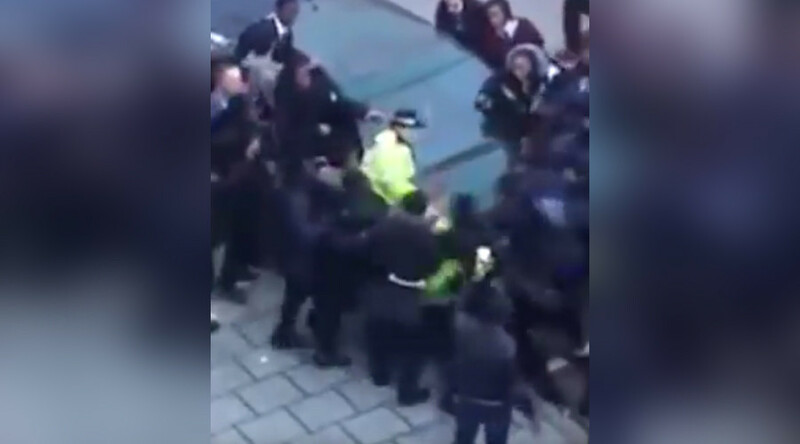 This latest skirmish began when a girl from Hatcham College and another from Deptford Green School had arranged to fight after school, according to the Sun. Two police officers on patrol in the area intervened when they noticed a large knife being concealed by a young male. A witness at the scene disputes this however, claiming they did not see a knife. Mobile phone footage shows how the group of around 30 children quickly turned on the police and pinned the male officer onto a car bonnet before dragging him to the ground. At this point several children surrounded the besieged officer and began stamping on his head. A man, thought to be a teacher, then intervened, leading to a standoff before police reinforcements arrived and the injured officer could be taken to hospital, according to the Sun. “The officers were dealing with one boy and suddenly all hell broke loose,” a witness quoted in the newspaper said. They lashed out at the female officer and then a guy in a suit stepped in to calm things down. He held them off until several police cars turned up with sirens and flashing lights. “Apparently the kids thought the boy was being choked. Police said there was a knife but I never saw one,” the witness added. A 15-year-old boy was arrested on suspicion of causing actual bodily harm and was bailed following the incident. Metropolitan Police Federation chairman Ken Marsh said: “This film is truly shocking. These images highlight the dangers that police officers face day in and day out while patrolling the streets. Police in Lewisham are appealing for information and witnesses to the attack.